Lacro Engineering provide high quality revolving industrial door systems in varying configurations. 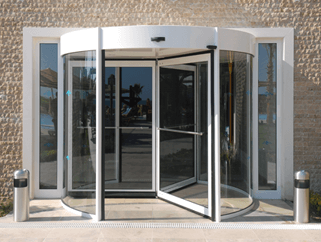 Revolving doors are available in hundreds of configurations to meet virtually any application. The beauty and elegance of Manual, Automatic, and Security revolving doors can be found in all types of buildings that are both functional and beautiful. Combining state of the art technology and the safety of its operator with the specific needs of each building revolving doors offer high degrees of flexibility and customisation through its aesthetic appearance, wide range of available materials and surface finishes. Technical advances in thermal and acoustic insulation ensure the revolving doors offer real energy saving benefits. By reducing the amount of energy loss, you can help the environment and at the same time see significant savings on heating and cooling costs. In addition to revolving door systems, Larco Engineering have expertise in the installation and repair of automatic sliding doors for industrial and commercial units throughout Ireland.